Since February 24, 2014 BDCs have dropped 7% due to concerns related to being excluded from certain indices. If BDCs are removed from the Russell indices it could lead to declines in institutional ownership. Some BDCs could experience higher volatility due to changes in ownership. BDCs have fallen an average of 7% since S&P announced on February 24, 2014 that it would remove BDCs from its indices and was followed by Russell on March 3, 2014. This article is a follow up to "BDCs and the Russell Indices" and will cover the potential exposure that BDCs have to the amount of institutional investors invested in the sector that is currently around 40% of the average BDC. My priority for this series is to cover the potential short and long-term impacts of these changes as well as the opportunities and risks to investors. Eventually I will cover why the indices are excluding BDCs and why the SEC should remove the Acquired Fund Fees ("AFF") reporting requirements. To be honest I am hoping the SEC will make the right decision before I finish because they have removed the requirement for many similar types of investments including banks, CLOs and mREITs. Institutional ownership refers to the ownership stake held by large financial organizations and pension funds that generally purchase large blocks of a company's outstanding shares and can exert considerable influence on management. Portfolio managers often have teams of analysts, as well as access to corporate and market data that most retail investors do not. Institutional turnover in most stocks is quite low. However, if a portfolio manager is having a bad quarter, he or she might dump underperforming positions (and buy into companies that have trading momentum) in the hope of achieving parity with the major indexes in the following quarter. The pressure on these managers and the resulting fickleness can lead to volatility and hurt the individual investor who happens to be on the wrong side. Why would institutions sell BDCs if there were no longer included in the Russell indices? Portfolio managers are more likely to invest in sectors and companies that are included in certain indices for a few reasons. Most importantly is the risk of investing in something that performs poorly and is outside their index category. As discussed in Part 1, BDCs with lower trading volumes will be more at risk over the next two months especially if non-index related funds and institutions start to sell ahead of the Russell rebalance. 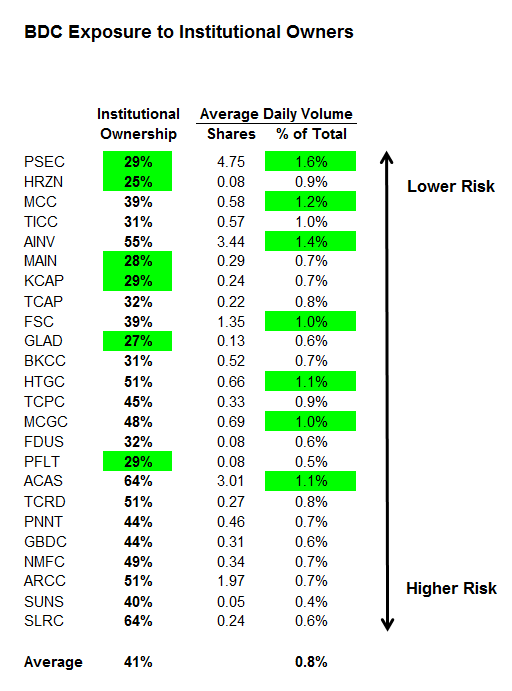 The following table shows the current amount of institutional ownership by company along with its trading volume as a percentage of total shares. I have listed them in order from lower risk of exposure at the top but this is using simple math and does not account for current trends or the quality of each company. Prospect Capital (NASDAQ:PSEC) is the winner in this scenario due to its lower than average institutional ownership levels and much higher trading volumes. Most of PSEC's shareholder base is retail already. Other BDCs with higher volumes and/or lower exposure are Main Street Capital (NYSE:MAIN), Medley Capital (NYSE:MCC), KCAP Financial (KCAP), TICC Capital (TICC) and Horizon Technology Finance (NASDAQ:HRZN). Many of the larger BDCs have higher amounts exposure including American Capital (NASDAQ:ACAS), Solar Capital (NASDAQ:SLRC), Apollo Investment (OTC:AINV) and Ares Capital (NASDAQ:ARCC) that are all above 50%. SLRC and ARCC seem to have higher amounts of risk using this methodology. 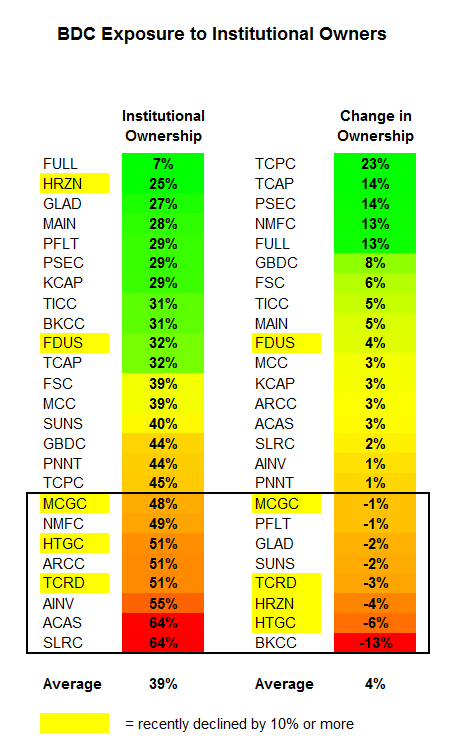 I did not include Full Circle Capital (FULL) in this analysis because it is a microcap that institutions do not usually invest. It is also important to look at recent trends in institutional ownership by company. The table below shows the ownership percentage along with the change in ownership this quarter. I have also highlighted the companies that have recently declined more than 10% discussed in Part1. Hercules Technology Growth Capital (NYSE:HTGC), THL Credit (NASDAQ:TCRD) and MCG Capital (NASDAQ:MCGC) have all seen larger stock price declines than the other BDCs with higher amounts of exposure and declining institutional ownership. BlackRock Kelso Capital (NASDAQ:BKCC) has been showing large declines in institutional owners over the last two quarters and is not necessarily related to the indices. I will continue to track these trends in the coming articles because I believe this is an important indicator, not only for individual companies but for the industry as well. The rest of this series will continue to focus on the potential impacts to BDCs and the current pricing anomalies that investors should be taking advantage of. Investors should only use this information as a starting point for due diligence. Disclosure: I am long HTGC, MAIN, TCPC, FSC, ARCC, FDUS, TCRD, PSEC, NMFC. I wrote this article myself, and it expresses my own opinions. I am not receiving compensation for it (other than from Seeking Alpha). I have no business relationship with any company whose stock is mentioned in this article.